What to do with your leftover turkey carcass? Follow this Turkey Broth recipe from a leftover turkey of course! It’s such a shame to waste turkey leftovers. Plus you get the benefit of the seasoned roasted turkey flavors in your meat. Can You Freeze Turkey Broth? Now sometimes after Thanksgiving or Christmas, you are in turkey overload, and more turkey is the last thing you want. It’s easy to make this turkey soup stock and pop it into the freezer to have at a later date. Don’t freeze them the turkey broth in glass jars. I use plastic bottles from soft drinks to fill with the broth, it works perfectly! You can make any soup with Turkey Broth From Leftover Turkey. My favorite turkey broth recipe is Turkey Wonton Soup, which is a refreshing change from Turkey hangover! The Asian flavors and the lighter soup make a welcome change from the heavy holiday meals. Just throw your turkey bones, veggies and herbs into a large stockpot, and allow to simmer. The longer you allow the turkey carcass to simmer, the tastier your soup will be. And we all love tasty soup! 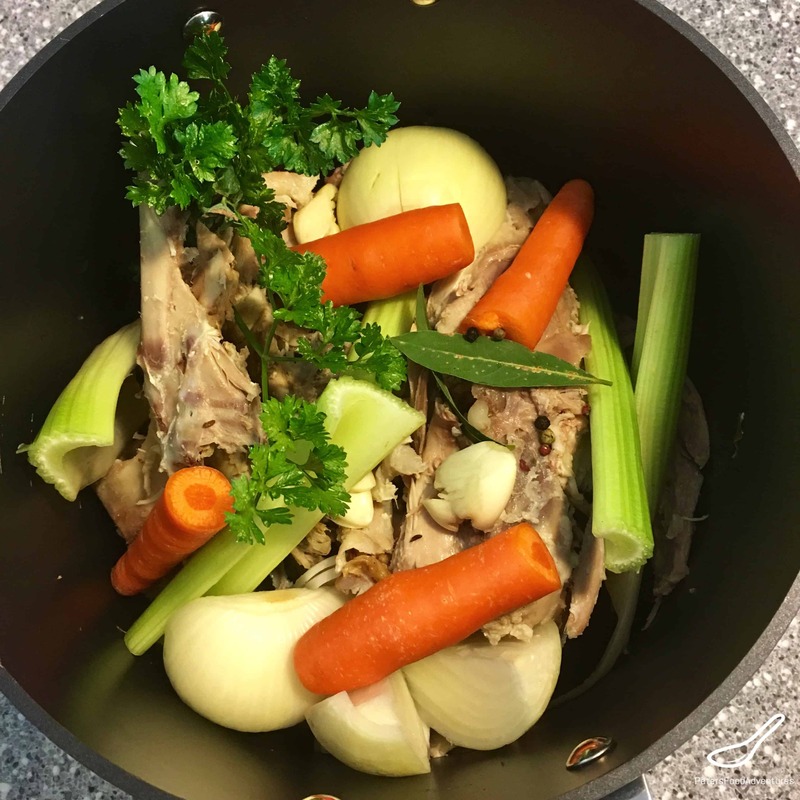 It’s so easy to make a delicious Turkey Broth from leftover Christmas or Thanksgiving Turkey. Don’t throw you leftover Turkey away, make this soup instead! Bon Appetit! Приятного аппетита! Place the turkey carcass in a large stockpot or dutch oven. Break down the carcass if necessary to fit into the pot. Add water, herbs and vegetables and bring to a boil. Reduce heat to a simmer and allow to simmer for 2 hours. When broth is done, strain it and remove any turkey pieces that can be chopped and put back into the soup. I usually strain the broth once with a colander to remove the big pieces, then a second time through a cheesecloth for a clear broth. Season to taste. Keep broth refrigerated until ready to use. I do enjoy making turkey stock from the leftover bones following Thanksgiving. As you mentioned, I place it in the freezer and use it to make risotto on a cold winter’s day. You can’t beat it! Yes! Excellent for risotto!!! ???????????? I love to make turkey broth! Chicken broth too! Love the way it makes the house smell good for hours! Yes, that comforting smell of home cooking!! ???? yum! Thanks Koko! Anything healthy and tasty is a win! ??? ?